Plato (Greek: Πλάτων, 427. BC. – 347. BC.) was a Greek philosopher from Athens who is considered as one of the most influential people in the history of western civilization. He was Socrates’ student. Thanks to Plato, we have a significant source of information about Socrates. Plato founded the first institution of its kind – the Academy. Aristotle was a student of that academy. Plato’s best-known work is “The Republic” – a book in which he wrote about a utopian image of an ideal society that would be ideally run by philosophers. Plato left a lasting mark on the development of many minds that came after him. He is one of the most influential figures of the course of development of modern western society. Plato once demonstrated his knowledge with his so-called allegory of the cave. It is found in the seventh book of dialogue in “The Republic”. It is quite vivid and serves as an important example. He invites us to imagine a cave. In it, there are people who have been chained and are unable to turn to any other direction except for the inner wall they are facing. Because of the chains they cannot see anyone besides themselves nor can they see the cave’s exit, which is directly behind their back. The only source of light in the cave is a camp fire. Between people and the fire, there is a cover behind which there are other people that go about on their own business. They are walking past, carrying statues of men and animals made of stone and wood, etc. Those that are chained and observing a blank wall can see, because of the fire, the shadows of themselves and of that which is happening behind them. As they are walking by, some of the people behind the cover are talking among each other while others are silent. The voices echo in the cave while the shadows dance on the wall thus making it appear to the chained ones as if the shadows are real and talking. Since they have no other things to do except for talking about the shadows – those in chains try to guess which shadows shall past next and in what order. Those that are the best at guessing are granted with honors and get more acclaim than the others. Plato compares us to those who are chained to the cave wall in his metaphor. He points out that we believe and think we see reality by watching the shadows on the wall. He states that we should consider the possibility of releasing one of those in chains to stand up and turn to face the light from the exit of the cave. The sunlight would cause great pain to this person as he or she would be used only to darkness. Thus, no clear vision would be possible. If he or she got used to the light and saw what was really happening behind the cover in the cave, a revelation of the delusion would occur. An enlightenment. 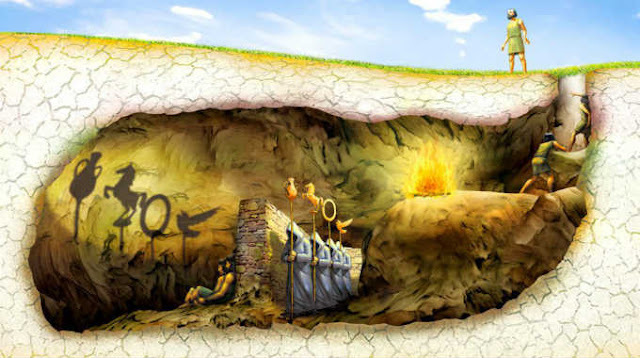 Plato’s allegory of the cave serves its purpose to represent the life of an individual. A life of learning and knowing by using our senses and entrapment and obsessiveness with the body and all things material. Exiting the cave means the soul’s rising into a world of ideas. This is accomplished by learning with reason and a mind clear of delusions. He concludes the allegory of the cave by asking the question of what would happen to the one who got out of the cave and had observed the Sun. What would ensue if he or she tried to explain to the chained ones to what was really happening – of what was the real truth?The revelation would seem impossible to the others and they would declare the “enlightened one” to be mad. Even if an attempt was made to release them and take them out of the cave, it would only lead to the demise of the “enlightened one”. Plato used this metaphor to allude to the fate of his mentor Socrates who was charged and executed by the Athenians. Now, let us approach this topic from another point of view – a 21th century one at that. Does the Allegory of the Cave Remain Relevant in Our Times? The question you should be asking is whether you are the one in chains or the one who “sees” matters for what they truly are. Or even still, if you are chained to the wall in front of you to revel in the glorious shadows for an entire lifetime – would you know it? There is another question – would you want to change it? Would you have the courage to make that audacious step to come out of your comfort zone? For the brave and the bold, there is always a way out of the cave. It isn’t as simple as taking the red pill, as Neo did in the movie Matrix, unfortunately. It is a challenging process of change and self-improvement for every individual. Through hours spent on finding, learning, validating and putting the newfound knowledge into practical use. All knowledge is useless if it is not being used for a persistent and purposeful practice. Step out of the “cave” into the light and do not stop trying to tell the others what you’ve experienced on the outside. Be the change and you will change the world around you!